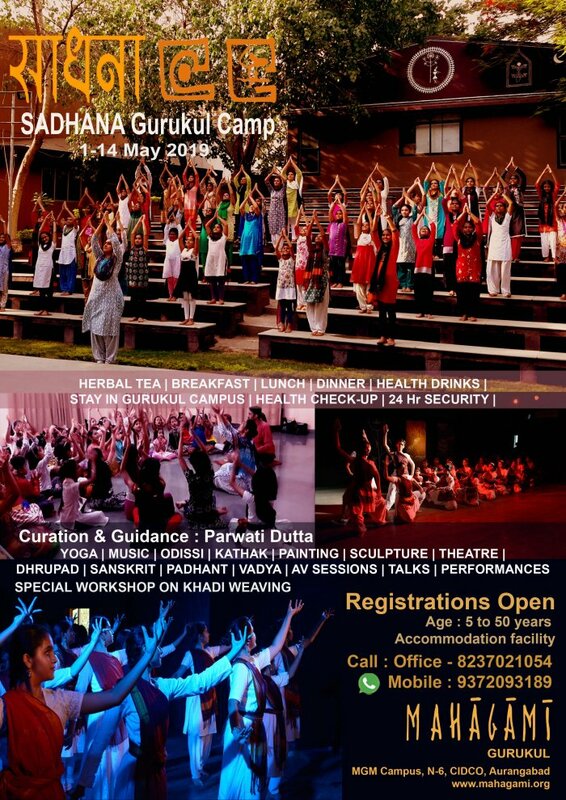 MAHAGAMI organizes its annual Sadhana Gurukul Camp at Mahagami from 1 to 14 May 2019. This year being the 21st year of Sadhana, there will be special sessions on Khadi weaving, its ideology and aesthetics to mark 150 years of Mahatma Gandhi. The aim of Sadhana has been to introduce Gurukul lifestyle and reinstate the ancient concept of learning which essentially emphasizes on integration of various streams. Starting with Herbal Tea and Yoga session at 6am, the day unfolds with intense sessions on music, Sanskrit, Kathak, Odissi, visual arts, theatre and vadya concluding with prayer under the banyan tree at 8pm. The camp is residential for outstation participants and for those who wish to be completely immersed in learning, contemplating and imbibing. Young learners of age 5 to 10 years can enroll for the Mini-Camp which will be from 3 to 6pm daily between 1-14 May. A special concession of 25% will be given to all past Mahagami students and to past SADHANA participants.